Glacial cycles at 104-yr time scale have been the focus of Quaternary paleoclimatology over the last century. In recent years with the emergence of continuous high-resolution records (ice cores, deep-sea sediments etc.) from the longer geological past, increasing evidence underscores the significance of long- duration processes at the time scale of 105-yr or more. WANG Pinxian and colleagues from the State Key Laboratory of Marine Geology, Tongji University, reviewed long-term variations in the oceanic carbon reservoir and indicated their crucial role in major climate regime changes over Quaternary glacial cycles. This work, entitled "Long-term cycles in the carbon reservoir of the Quaternary ocean: a perspective from the South China Sea", was published in National Science Review. 2014, Vol 1(1): 120-144. A puzzling question in Quaternary paleoclimatology is why the interglacials are different, even with similar orbital parameters? The recent findings in the South China Sea offer a new clue for its solution. In well preserved deep-sea sediment sections recovered by Ocean Drilling Program Leg 184 of the South China Sea in 1999, three long-term cycles (~500 kyr) in Pleistocene carbon isotope (δ13C) sequence have been found and demonstrated to be common in the global ocean (Figure 1). Because carbon has a residence time of 105-yr in the ocean, the long-term cycles are best represented by oceanic δ13C. 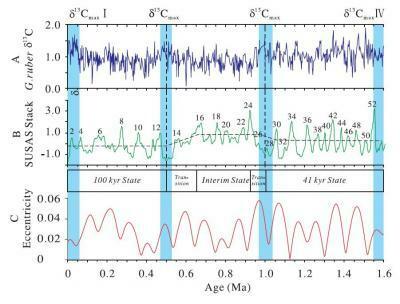 Before the Pleistocene, the oceanic δ13C sequences display a 400-kyr signal related to the long-eccentricity of orbital forcing, with carbon isotope maximum events (δ13Cmax) occurring at the eccentricity minimum. The long eccentricity 400-kyr cycles of δ13C can be hypothetically explained by changes in ratio between particulate and dissolved organic carbon (POC/DOC) in the ocean, depending on the monsoon-controlled nutrient supply. southern South China Sea. (B) Triple division into '100-kyr state', 'interim state', and '41-kyr state' based on Subtropical South Atlantic Susceptibility (SUSAS) stack indicative of carbonate preservation. (C) Eccentricity . After 1.6 Ma, however, the 400-kyr cycle in δ13C is obscured. The δ13C maxima are out of phase with the eccentricity signal, extending the periodicity to ~500-kyr（Fig.1）. The paper explains that the ocean restructuring at 1.6 Ma marked by the isolation of a sluggish abyss under the Southern Ocean could have disturbed the long eccentricity rhythm in the oceanic carbon reservoir and extended the 400-kyr cyclicity of δ13C. Interestingly, long-term processes of 105-yr exist also in the hydrological (ice sheet changes) cycles. The last million-year period has experienced two major changes in the climate regime, namely the mid-Pleistocene transition (MPT, centered at 0.9 Ma) and mid-Brunhes event (MBE, at 0.4 Ma). 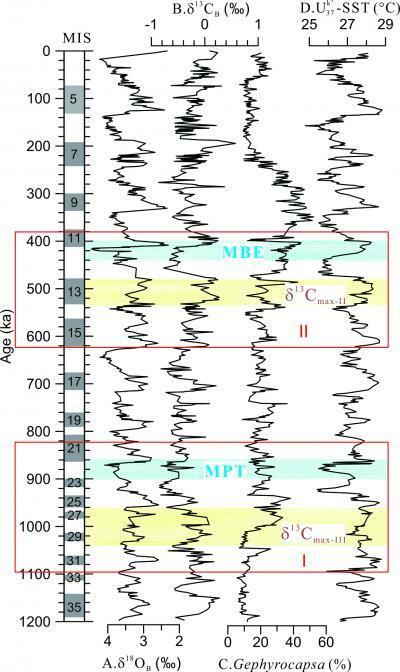 The MPT represents intensification and prolongation of the glacial /interglacial cycles from 41- to 100-kyr frequencies, while the MBE is considered as a critical period of transition to enhanced amplitudes of glacial/interglacial cycles. Thus, the South China Sea records reveal that long-term processes in ice-sheet and carbon cycles are connected. As seen from Figure 2, the MPT and MBE were preluded by δ13C max-III∼1.0 Ma and δ13Cmax-II ∼0.5 Ma, respectively, and both the δ13Cmax events were in turn prefaced by unusually warm interglacials in the Antarctic region (Table 1). The causal link between these long-term processes remains unclear, but one of the crucial mechanisms could be the nutrient transfer from the Southern Ocean northward, which led to major changes in the biological pump of the global ocean. The paper concludes that the long-term biogeochemical processes originating from the Southern Ocean must have played a crucial role in ice-sheet waxing and waning, and the major environmental events in the Quaternary comprise a continuing chain of events that remain a largely ignored aspect in climate studies. This shosws late Pleistocene major events recorded at ODP Site 1143, southern SCS.